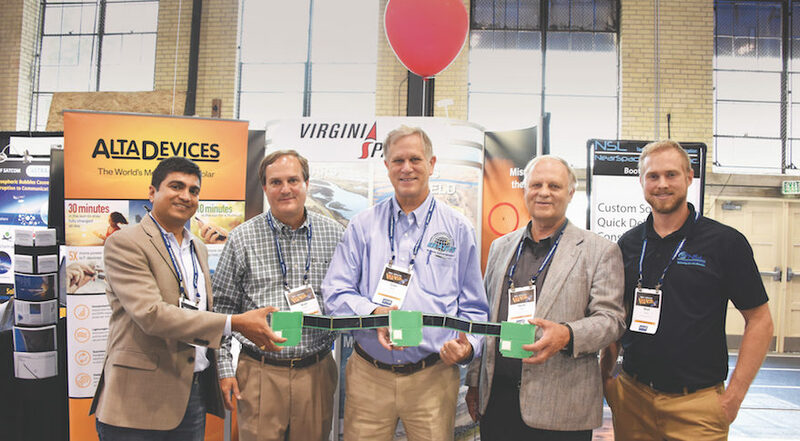 For a year, the Virginia Commercial Space Flight Authority, Twiggs Space Lab, Orbital ATK and NASA’s Wallops Flight Facility have been collaborating on a campaign to encourage Virginia students to design, build and test Thinsats, which are a seventh the size of cubesats. Now that cubesats have graduated from college, so to speak, ThinSats have come along as an affordable project for college, high school and middle school students. With time, ThinSat inventor Hank Voss thinks they will shake off the “just a toy” stigma early cubesat proponents know so well. For years, Twiggs, a passionate advocate for science, technology, engineering and math education, has been promoting satellites that are easier to build and less expensive to launch than cubesats, including the PocketQube, a satellite that measures five centimeters on each side. PocketQubes never caught on the way cubesats did, though. They are tricky to build because students have to connect multiple layers of printed circuit boards. Plus, there’s little room for exterior solar arrays and PocketQubes don’t work well with traditional cubesat deployers, said Walter Holemans, founder and chief engineer of Planetary Systems Corp, the Silver Spring, Maryland, company manufacturing ThinSat dispensers. The problem came to a head in 2016 after Twiggs ran into Warren Frick, Orbital ATK’s advanced projects manager, at the Small Satellite Conference in Logan, Utah, and asked to launch PocketQubes from the Antares rocket’s second stage. As it turned out, Orbital ATK already had an agreement with Virginia Space to set aside room for 12 cubesats on the International Space Station cargo resupply flight scheduled for fall 2018. 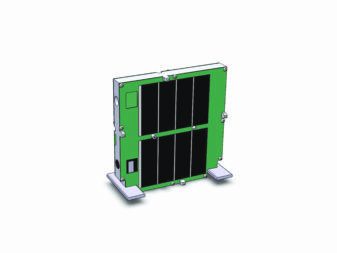 Within weeks, Orbital ATK and Virginia Space agreed to replace the cubesats with PocketQubes. To figure out how to launch PocketQubes, Twiggs turned to his friend Voss, a retired engineering and physics professor at Indiana’s Taylor University and NearSpace Launch (NSL) president, chief executive and chief scientist. A Twiggs Space Lab rendering of the ThinSat concept. To be precise, ThinSats measure 111 by 114 by 12.5 millimeters. Pins used to separate them bring the total width of each ThinSat to 17.4 millimeters. It was “one super idea,” Twiggs said. ThinSats are built in a single layer, meaning one printed circuit board that is easy to design, assemble and test. Atmospheric drag in extremely low Earth orbit where the Antares second stage drops them off will orient them with the thin side forward. Best of all, 21 ThinSats fit in Planetary Systems Corp.’s Canisterized Satellite Dispenser without any extra packaging, Holemans said. “Besides, a satellite that looks like a piece of bread is cool,” Twiggs said. Twiggs Space Lab has developed a three-phase curriculum to lead students through the process of designing, developing, testing and operating ThinSats in addition to collecting, analyzing and presenting data they acquire with onboard sensors. 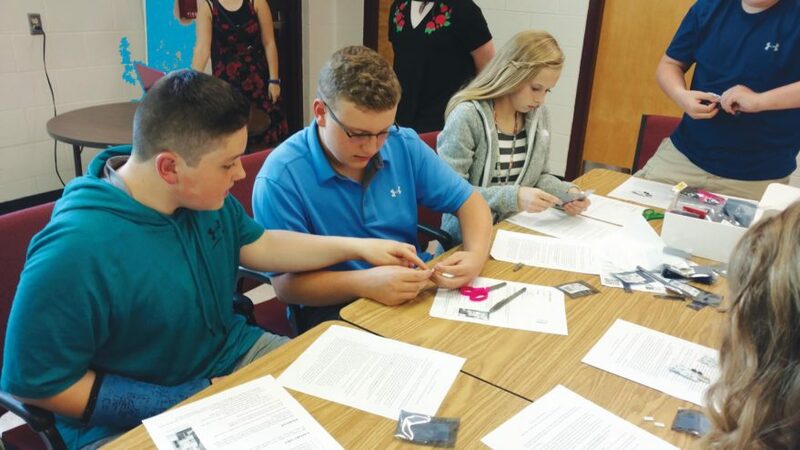 Students at Coeburn Middle School in southwestern Virginia work on their ThinSat kits. In the first phase of the ThinSat curriculum, students will experiment with plug-and-play sensor chips developed by XinaBox Inc. of Delaware, that are easy to program and connect without soldering. Then, students will build FlatSats, satellites on printed circuit boards to test on low-altitude balloons. In the program’s second phase, students will design payloads to integrate in ThinSat engineering models that NSL of Upland, Indiana, will send to an altitude of 36 kilometers on high-altitude balloons. Finally, students will use data from their initial experiments to develop the ThinSat payloads Antares will launch into 200-250-kilometer orbits. At that altitude, ThinSats will spend roughly five days in orbit before reentering the atmosphere, which Twiggs said perfectly matches the attention span of students. Another benefit to the low altitude and speedy reentry is that “they can’t get on our case for creating debris,” Twiggs said, a concern that nagged at PocketQubes, which critics said were difficult to track with ground-based radar. ThinSats will travel in a region of the atmosphere that is important to climate and weather forecasts, but rarely studied because atmospheric drag makes it hard to keep satellites there, Voss said. Students will outfit ThinSats with sensors and miniature Globalstar radios supplied by NSL to stream data continuously through the Globalstar constellation to the internet. With internet streaming, students will get more data in five days than they would in six months with individual ground stations, Twiggs said. Twiggs, an astronautical engineering professor at Kentucky’s Morehead State University, has graduate students testing the ThinSat curriculum. In Virginia, which is the focus of the ThinSat educational campaign, the University of Virginia, Virginia Polytechnic Institute and State University, the College of William and Mary, and Old Dominion University are collaborating with nearby middle and high schools. “It’s a great opportunity for universities to interact with students in their area and obviously, younger students will benefit from the experience of the graduate and undergraduate students,” said Matt Craft, Twiggs Space Lab co-founder and business development vice president. Everyone involved in the ThinSat program is extraordinarily enthusiastic about its potential to engage students long before they are ready to build cubesats. Virginia Space, which owns and operates the Mid-Atlantic Regional Spaceport on Wallops Island, agreed to fund the entire first run of the program and to help schools pay for future missions. “I’d like the opportunity to touch every corner of Virginia and beyond,” said Dale Nash, executive director of Virginia Space and the Mid-Atlantic Regional Spaceport. The manifest for the first ThinSat mission is “full to capacity,” said Brian Crane, Virginia Space ThinSat lead. Virginia Space and Twiggs Space Lab are signing up schools for future flights. In preparation for the first mission, Twiggs Space Lab is setting up an online Space Data Dashboard, complete with instruction and videos on satellite manufacturing, environmental testing, satellite integration, launch vehicles, spaceports, range safety and spacecraft operations. The Dashboard will include tools to help schools coordinate ThinSat programs. Eventually, Twiggs and his team plan to invite schools around the world to build ThinSats. Twiggs, for his part, is eager to see students go through the full life cycle of a satellite with ThinSats. That was the idea behind cubestas, but as a professor Twiggs found it impossible due to the complexity of the satellites and payloads coupled with the difficulty of obtaining rides into orbit at a reasonable cost. Cubesat launch costs rose as government and industry teams began adopting the form factor that was once used primarily by university researchers. ThinSats are likely to cost one-tenth as much as cubesats to build and even less to launch, Voss said. Twiggs hopes Antares rockets will make room for ThinSats on multiple flights, providing students and teachers with frequent rides into orbit. ThinSat proponents also are talking to other launch providers about making room for the diminutive spacecraft. This article originally appeared in the Oct. 23 issue of SpaceNews Magazine.